I’m delighted to hear that mission STS-121 Discovery is launching tomorrow, after delays due to weather, and concerns over fuel-tank foam. Zero hour is 1938 BST (that’s 1438 local time in Florida). 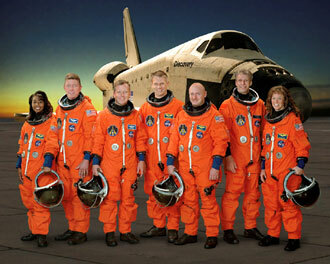 I closely followed the STS-114 mission in July and August last year, using the Nasa TV and Radio features. I can highly recommend listening to the stream from mission control. Listening to the crackle of the communications from space is hypnotic. “Clear for Zaragoza” – Mission control gives this call to the shuttle pilots only a few seconds after lift-off. It means that, should the mission be aborted, the shuttle can glide to Spain and land at Zaragoza Air Base. I think this is amazing. The re-entry manoevres – When returning to earth, the shuttle flips itself forward 180 degrees onto its back before firing its thrusters and falling out of the sky. This is also amazing. Comedy E-mail Moments – NASA have spent billions of dollars putting men on the moon, and returning the Space Shuttle to flight. However, I think their e-mail system may still need some investment. Despite the advanced technology that allowed a rendezvous with the International Space Station hundreds of miles above the Earth’s surface, the astronauts aboard STS-114 Discovery could not always rendezvous with their e-mail messages. This is amazing too, but for different reasons. Problems first arose on the first day of Discovery’s mission. Commander Eileen Collins radioed mission control at Houston, to ask for the Day 2 Mission plan to be re-transmitted to the orbiter. Apparently, none of the computers aboard the shuttle could open the attached document! Just like thousands of ordinary office workers on terra-firma, the NASA controllers dutifully cut-and-paste their entire briefing into the body of the e-mail message, ensuring the Astronauts were able to follow instructions for the planned space-walks. E-mail problems did not end there, however. Six days into the mission Pilot Jim Kelly was forced to radio to the ground once more. Apparently, the crew had begun to receive crucial e-mails “in Greek”. Finally, e-mail communication systems went down for a few hours, because someone had forwarded on a particularly large attachment. I did not hear whether the astronauts recieved any space spam, or whether any crew members accidentally hit ‘reply-all’ and sent an embarrassing message to two-hundred people. Maybe this time. I do recall that the astronauts would often refer to their “Outlook”, although it was unclear whether they were talking about the stunning views… or the popular Microsoft E-mail programme. Ineresting how it is the little things that these specialists get wrong – back to the football – I mean, the little thing of numbers of strikers taken in the squad! Well, I am amazed that they have email access at all. How are they connecting to a phoneline for a start? Via their mobile phones? In which case they are dependent on their batteries and on getting a signal. It all seems highly precarious to me that they should use what is well-known on earth to be a temperamental set of technologies for the transmission of vital information. One would think that such things as mission plans could be printed out and given to them before take-off. Presumably the mission plan is created in advance and not on the hoof. And any ad hoc changes can be dictated to them, surely? I think that much of it is indeed created on the hoof, to account for the latest diagnostics and measurements. They know in advance what they are supposed to be doing, but not the exact degrees to which they should be doing it. Next PostNext A Most Respectful Letter from an Englishman in Scotland, to a Scotsman in England; In Which the Subject of Their Shared Britishness is Discussed at Some Length.